On Saturday, June 16th, the brightest stars of the talent-rich Florida State League will take the field for the League's All-Star Game in Tampa, Florida. Among those prospects will be members of the Palm Beach Cardinals. Last season, Palm Beach had three members named to the South team in a year in which it was Co-Champions of the Florida State League. In 2018, six members were named to the all-star squad, tied for the most by a single team in the Florida State League. Left-hander Evan Kruczynski has had a solid start to this 2018 season. The former ninth round pick is 4-1 with a 3.98 ERA and 1.29 WHIP through his first 10 starts of the seasons. As of June 1st, when the teams were announced, his 55 strikeouts were tied for most in the Florida State League. Second baseman Andy Young is second on Palm Beach with six home runs and 18 RBI and owns a .272 mark at the plate with a .355 on-base-percentage and .804 OPS. Among second baseman, he leads the FSL in home runs, OPS, and OBP, and ranks second in RBI. Catcher Jose Godoy is off to a hot start at the plate with a .333 batting average and .417 on-base-percentage. The 23-year-old has yet to commit an error this season and spent time in Double-A earlier in 2018 before returning to Palm Beach. Third baseman Evan Mendoza has been promoted to Double-A Springfield but was named to the Florida State League All-Star Game. The Cardinals' 29th ranked prospect according to MLB Pipeline, Mendoza hit .349 with a .394 on-base-percentage through his first 37 games. Last season, he was named to the New York Penn League All-Star game after hitting .370 through 41 games for the State College Spikes. Anthony Shew has also been promoted to Double-A Springfield but made his mark in Palm Beach. The Cardinals' Opening Day starter was 4-1 with a 2.11 ERA through his first eight games. In his final four starts before his promotion, Shew allowed just three earned runs in 21 1/3 innings pitched. 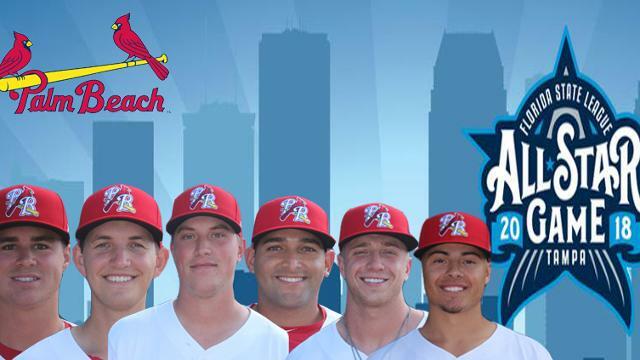 Out of the bullpen, Will Latcham will be the sixth and final Cardinal player heading to Tampa for the All-Star Game. The 22-year-old leads the Cardinals with five saves and has struck out 30 batters in his first 19.2 innings pitched. His 17 games pitched ranks tied for third in the FSL. As Co-Champions of the 2017 Florida State League season, the entire Palm Beach coaching staff will be heading to All-Star Weekend as well. Manager Dann Bilardello will lead the South squad with Hitting Coach Brandon Allen, Pitching Coach Will Ohman, Trainer Chris Whitman, Strength and Conditioning coach Ross Hasegawa and Coach Craig Robinson accompanying the skipper. You can watch the Cardinals and all the other rising stars from the Florida State League at the annual All-Star Game which is hosted by the Tampa Tarpons in 2018. The Homerun Derby will take place on Friday, June 15th with the midsummer classic taking place Saturday, June 16th at 6:30 PM. Tickets and more information can be found at https://www.milb.com/tampa/tickets/asg.